The UK’s market event for Children’s Publishers, Authors’ Agents, TV, Interactive, Film, Games and App Producers went to The London Book Fair. The CMC Rights Exchange was a must for anyone looking to buy and sell children’s IP – especially if looking to build partnerships to take content across platforms. For the first time, the CMC Rights Exchange took place at The LBF, offering a wide range of new benefits including access to 1500 exhibitors and 25,000 publishing professionals from around the world. Access to CMC-curated conference-style sessions exploring case studies and executive opinion on new ways of building content brands. Access to pre-bookable one-to-one meetings to develop those new relationships. Delegates received an invitation to the bespoke meeting system and then uploaded their profile, providing all the other attendees with information on their expertise, portfolio of work and interests at the market – and making the booking of meetings relevant and efficient on both sides. Joining the Rights Exchange gave delegates a free pass to The London Book Fair at Olympia from Tuesday 14 till Thursday 16 April. For £150 + VAT delegates had access to the Rights Exchange (including its conference content), the meetings booking system and a dedicated meeting table. Full access as a visitor to The LBF is included. For £120 + VAT delegates had access to the Rights Exchange (including its conference content) and the meetings booking system and one-to-one meetings, without a table. Full access as a visitor to The LBF was included. 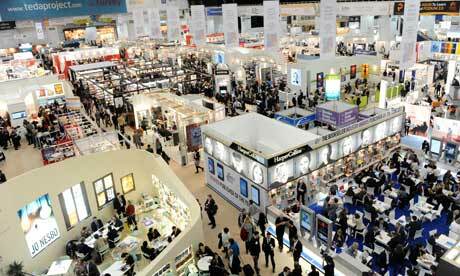 The CMC Rights Exchange @ LBF was situated within The London Book Fair at Olympia London in Kensington. Travel and venue information can be found on their website here.